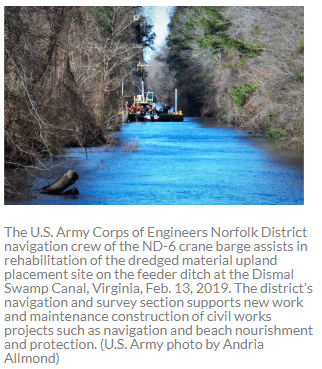 Traveling south, the Dismal Swamp Canal route exits the Waterway westward immediately south of the I-64 fixed bridge at statute mile 7.1. No wake is already the recommended speed for the narrow canal, not only for safety, but for the enjoyment of the natural surroundings. Extra caution is required in the vicinity of the dredge equipment.